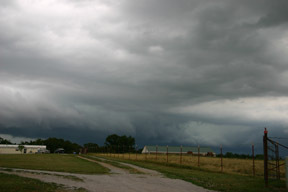 I chased in central MO today; got occasional peeks at outflow-dominant storms through gaps in the trees. Oh, wait a minute - you know that, since I already said I chased in Missouri. I headed out too late due to stuff that came up at work, but still figured I would see something in the way of storms, and if I could get far enough west into the extremely unstable air in central and especially western MO, I might see something fairly interesting. Figured I could get at least as far west as COU and maybe a little farther, and did. However, the outflow pushed the storms on a more southeasterly course than I initially thought/hoped, and I had to bail off I-70 and cut SW to Fulton on route Z to avoid (sort of) getting cored. Got through Fulton a minute or two before the 1-inch hail hit there; did not encounter any hail, thankfully, but did get some estimated 40-50 mph gusts and wind-driven rain along the gust front. Dropped south to Jefferson City then went west on 50 to California to try to intercept the tail-end storm - not sure if I had it or not, but was close. Watched another hailer pass just NE of California and got some nice shelf cloud shots as I stood in the northeasterly/easterly winds created as the outflow seemed to deflect westward off the southerly/SSE inflow to the south. A problem with these storms was that the gust front/outflow boundary kept pushing south of the main convection. I could occasionally get ahead of it by moving south or west, but not for long - and the outflow ahead of the storms kept much in the way of rotation from being a possibility. Here is a picture of the shelf cloud taken from a mile or two south of California, MO a little before 5:00 p.m. Around the time this picture was taken, the storm produced hail to 1.25" and a wind gust to 60 mph. Another storm went up NW of California. At first it had a lowering under the updraft that looked a little like a wall cloud, but almost immediately it became elongated and turned into a shelf cloud. Seemed to be the story of the day. Even though the storms in central MO produced more in the way of hail (mostly .88 to 1.25) than wind (which was more common farther east, near STL), they had a very outflow-dominant character to them, so never really got close to producing a tornado. But with CAPE predicted at 5000 or higher, you kinda gotta try! One amazing thing about this complex of storms is that it began in Wyoming and Montana and went all the way southeast to Arkansas and Tennessee, affecting something like 10 states and lasting for more than 24 hours.